Guest contributions always take priority in my book, and today we have a nice item from a contributor who wishes to remain anonymous. I have mentioned before that a wide variety of pins were made featuring Harvey comics characters. I have also talked about the difference between pin-back buttons and the thick metal, enameled pins designed as collectibles rather than promotional items. 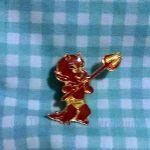 Today’s exhibit is one of the latter, a roughly one inch tall pin of our favorite little devil, Hot Stuff. The contributor mentioned purchasing the pin about thirty years ago at a 7-Eleven store. 7-Eleven is where I used to go at least once a week to check the spinner rack for new Richie Rich comics in the late 70’s and early 80’s. Unfortunately, there is no information on the back of the pin, so there is very little data to go with the exhibit. Enjoy anyway! 19 Exhibits Posted in Fifth Year!